The domino effect is hard to watch. Most of the time selfies are harmless, if not slightly obnoxious to scroll past in your Instagram feed. But sometimes selfies can destroy $200,000 worth of art. 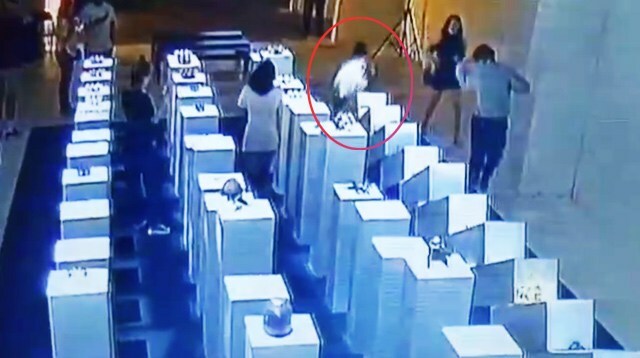 Earlier this month, a woman visiting an exhibit by Hong Kong-based artist Simon Birch at the 14th Factory in Los Angeles accidentally knocked over an entire row of sculptures when she leaned against one of the pedestals while taking a selfie. The installation that the woman knocked over was a collaboration called "Hypercaine" between Birch and other artists including Gabriel Chan, Jacob Blitzer, and Gloria Yu. "Three sculptures were permanently damaged and others to varying degrees," Yu told Hyperallergic. "The approximate cost of damage is $200,000." Here's what the installation looked like before it was knocked over. Incidentally, Carolina Miranda of the Los Angeles Times described the exhibit at the 14th Factory as a "series of wondrous, over-the-top sets for the perfect selfie." Just be careful if you plan on taking one yourself there.